A uniform policy on sexual harassment for all state and local governments, as well as contract labor and freelancers, but prohibits mandatory arbitration of sexual harassment claims in private businesses. A tax on opioid manufacturers based on market share, may raise as much as $1 million for New York coffers. $1 billion for full day Kindergarten, good news for the North Rockland school district, which was one of five districts in the state that only offered half-day. 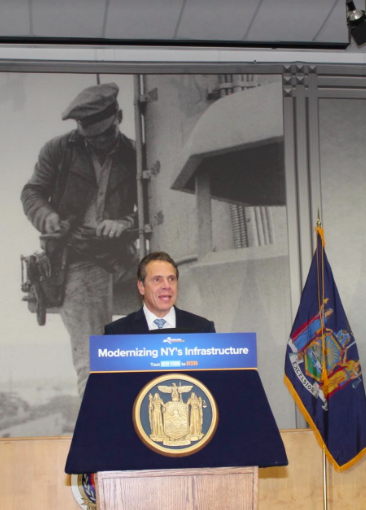 $2 billion to support the new Tappan Zee Bridge and other infrastructure needs on the Thruway system. NYS will offer tax credits for those who make charitable contributions to public education and health care to offset the new Federal tax code. A $4.4 billion deficit that the enacted budget does not address. An additional $1.7 billion shortfall projected under the new budget. No mandate to insure English, math and other mandated curriculum are taught in private schools. Those using NYC taxis will pay an additional $2.50 surcharge for rides south of 96thStreet. Uber and Lyft customers can expect a $2.75 surcharge…and cars and trucks are also on the list for a surcharge. Does not address medical marijuana. A committee of Albany lawmakers will be formed to determine whether they should receive an increase to their $79.500-year salaries. Their last raise was in 1999 under former Governor George Pataki. The budget contained no new ethics measures. Despite the recent conviction of Cuomo’s “other brother,” Joseph Percoco, there will be no resurrection of the Moreland Commission or any other oversight committee to combat corruption in the State Capitol.